This is a translated and adapted version of Ginette Mathiot’s Je sais faire la pâtisserie, the best-selling 1938 sequel to I Know How To Cook, this one devoted to pastries and desserts. In a similar fashion to the previous volume, I have worked on this project as a consulting editor, with a team made up of a translator, a copy editor, and the editor at Phaidon, to make Ms. Mathiot’s baking bible accessible to contemporary cooks. “From éclairs to soufflés and macaroons to madeleines, when it comes to desserts, no-one does it better than the French. Beautiful, elegant and delicious, French desserts are easy to create at home as only a few basic recipes are needed to make some of the world’s most renowned cakes and tarts. An inspiring collection to celebrate the sweet tastes of France. 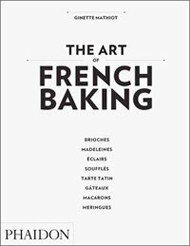 The Art of French Baking is the definitive collection of authentic French pastry and dessert recipes. From Tarte Tatin and Hazelnut Petit Fours to Cherry Tartlets and Choux Buns, it contains more than 350 simple recipes that anyone can follow at home. [December 2011] The Gift of Taste. [December 2011] Mastering the Art of French Baking. [November 2011] Blogger dishes on the art of French baking. [October 2011] Baking books: best of the new batch.